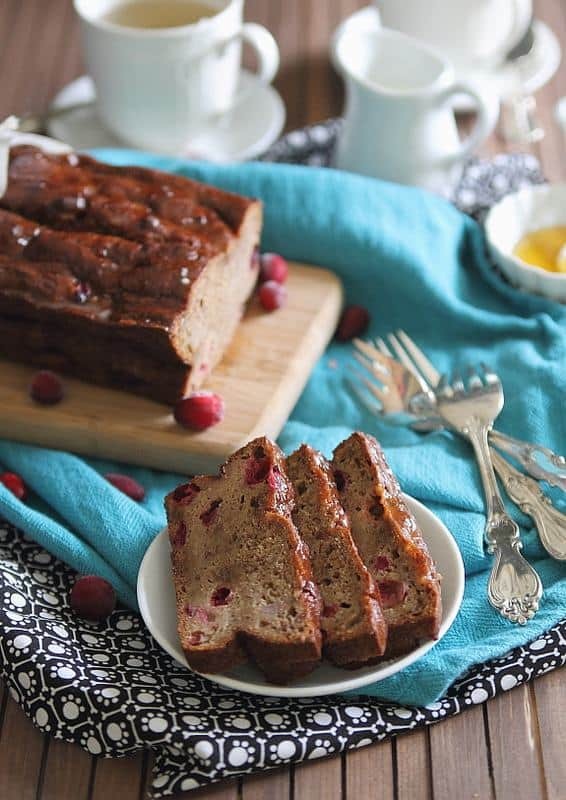 This cranberry banana tea bread is moist and just a bit sweet, perfect as an afternoon snack with some tea. You guys, I’m in love. His name is Kenmore. He’s 36 inches wide, has 6 burners and could easily roast 2 turkeys side by side. We signed contracts on the house we’re going to be buying (and pretty much gut renovating) last week and within 24 hours I started the convincing process…the one where I use as many analogies of garages/cars/toolboxes to ovens as I can possibly think of to justify why a $6,200 range is necessary to my husband. 48 hours after that, I’m in a Sears outlet store in Connecticut standing in front of a brand new Kenmore Pro 36” dual fuel range that has no scratches or dents like everything else in the warehouse and is over 40% off retail. I’m considering it my “statement piece”. Every room on HGTV that ever gets a makeover has a statement piece, this is mine. I use the stove at least 5 times a day, we’re completely gutting the kitchen so we can easily fit the cabinets around it and it’s almost half off! Budgets are made to be broken, right? Or maybe that’s rules. Whatever. So next time this cranberry banana tea bread gets made, it’ll be in Kenny in all his convection glory. Ps- I’ve decided it’s officially cranberry time. I’m done with pumpkin galore and onto little red balls instead. I actually like them and their tartness more than the whole pumpkin thing any way. So consider yourself warned, here they come! Add the mashed bananas, yogurt, egg and applesauce to a large bowl and whisk together until smooth. Add the sugar and vanilla and whisk again. Add the remaining ingredients except cranberries and mix together with a spatula until incorporated. Bake for 60-65 minutes until cooked through. Remove from oven, let cool in the pan for about 10 minutes before removing and cooling completely on a wire rack. Once bread is cooled completely, add confectioners sugar to a small bowl. Slowly add a teaspoon of orange juice at a time, mixing with a spoon until you reach the desired consistency for your glaze. Drizzle it on top of the bread and let set for a few minutes. You need to have a party at your house when it’s all done. So we can properly christen the oven which btw totally needs a name. Get thinking on that. Love the glaze – how creative! I bet this is perfect for an afternoon snack. Really diggin it! Yay for new kitchens (fyi I actually typed cushions first!). You’ll be cooking up a storm! I wish cranberries had arrived in stores here! I’m going head first in to all things cranberry when they do! YES! Definitely cranberry time!! Love our great minds ;) too bad we don’t live closer so we could switch our loaves with one another! I agree with Rachel, BHC5 party to break that kitchen in! Looking at this bread, I realized I need to buy cranberries. They’re totally going on the shopping list. I love their tartness too and always look forward to this time of the year to use them. P.S. I love the paw print fabric in the pictures. It’s so cute! you know, I never realized that fabric had paw prints on it until you said this! haha I use it all the time and never noticed that! I want a Kenny too! I swear my oven now barely holds one turkey… and don’t even think about sliding any sort of side dish in there with it! Oh and I’m sick of pumpkin too… it’s everywhere and I’m like bring on the cranberries baby! 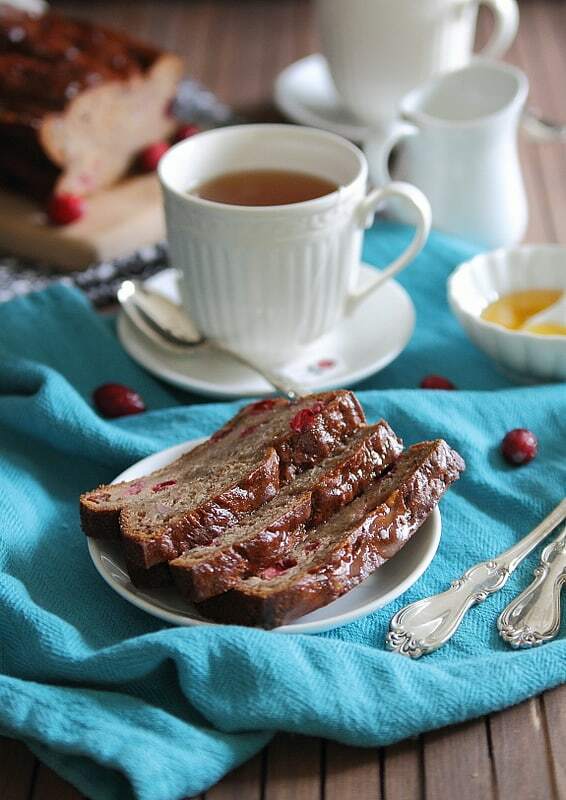 This tea bread is perfect and I would like two or ten slices pretty please! Is it weird that I’m jealous that you’re doing a gut reno? Because I reeealllly want to buy a house that needs a gut reno too. :) I can’t wait to hear how it goes for you! This bread looks like moist, autumn-y breakfast perfect. Delicious! Could I sub the almond flour with something else? I haven’t tried the recipe with substitutions. You could probably just use all whole wheat white flour though if you wanted.